Come out and join the Breakfast Club from the classes of '66, '67, '68 and '69 every 3rd Tuesday of the month at 12 Islands Restaurant in Crown Point, "On the Square". Breakfast begins at 8:00 AM. Hope to see you there. We are currently trying to create a yearbook archive. We are missing yearbooks from the following years: 1960, 1968, 1969, 1970, 1973, 1975, 1979, 1980, 1981, 1982, 1983, 1984, 1985, 1986, 1989, 1990, 1991, 1995, through 2012 Also, many years prior to 1955. We would really appreciate anyone willing to donate their yearbooks. Please contact us at crownpointalumni@yahoo.com and we will arrange to pick up your generous donations. 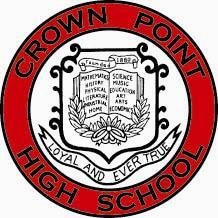 Click HERE to become a member of the CPHS Alumni Association. We are currently looking for classmates from the class of 1940 that would like to correspond with a gentleman in Califorina that graduated in 1940 and believes to be the only living person from the class of 1940.